Is Delhi Willing To Save Its Choking Lungs? Delhi’s ‘deadly smoke’ has returned. On November 7, among the flurry of short videos circulating on social media was one that made New Delhi’s smog seem exceptionally real. The video showed several cars piled up behind one another, even as more speeding cars, without a clear view, struck hard against the cars ahead. It is not known if passengers in those vehicles suffered grievous injuries, but to rest of India, the specter of Delhi’s annual smog at the onset of winter came to life. By the afternoon of November 8, the PM2.5 levels had surpassed 1,000. The World Health Organization’s recommended limit on the average level of PM2.5 in 24 hours is 25 micrograms per cubic meter; the permissible limit for India is 60. Authorities in Delhi declared all of its 6,000 schools and construction sites to be shut the next day. The city’s privileged classes that could afford to work from indoors with air filters and purifiers in their rooms, stayed indoors. But there was no respite for those in the unorganized sector, as has always been the case in the Indian capital where class lines are distinct. A health emergency was declared. It prompted the Costa Rican envoy to India to move to Bengaluru: the tech city known for its green cover, but which has also recently suffered unprecedented floods and water logging. Ironically, an ambitious plan to rain down water through helicopters to dissipate the smog fell flat, when the helicopters couldn’t operate due to the smog. Poor forecasting of weather patterns – as it was last week in Delhi, with colliding wind storms from east and west that locked moisture in the dust – meant little time for the government to take action. Delhi is surrounded by thousands of industries and construction dot almost every lane. It was convenient for politicians and the city’s privileged class to blame the smog on paddy-cultivating farmers in northern India, who burn the stubble of harvested crops across vast acres. However, even after the burning, the pollution will persist, and the grave reality of Delhi’s own source of pollution would not be easy to ignore. In June this year, the city recorded 10 million vehicles in the city, majority of which are motorcycles and scooters which are major polluters due to poor emission standards. In January 2016, following similar alarming pollution levels, the government in Delhi, led by the Aam Aadmi Party (AAP) put into force the ‘odd-even scheme’ of vehicles, based on the digits on their number plates, to reduce traffic congestion. On November 13 this year, the same scheme was proposed, even as its efficacy from 2016 is highly debated. India’s competitiveness with China thus extended into a new realm. Conversations were abuzz about comparisons with the pollution levels in Beijing. However, temporary measures like the odd-even scheme fall short of the drastic and long-term and holistic measures undertaken in Beijing. Delhi has been hesitant in bringing in a truly democratic public transport system. According to one report, there are just 272 buses per million people, and the city continues to see a decline in bus fleet. So even temporary and well-meaning measures like odd-even wouldn’t be effective with the city’s citizens deprived of means of transport. The Indian government aims at converting all vehicles into electric vehicles by 2030, but with diesel vehicles still plying on the streets, such an aim seems nothing but ambitious. India currently ranks 128th in meeting the UN’s Sustainable Development Goals (SDGs), with several low scores, including that on pollution. Unless pollution in Delhi – and across India – is viewed as political and not merely within the realms of the Health or Environment Ministry, all ambitions to meet the SDGs and continue on the growth story would be severely crippled. 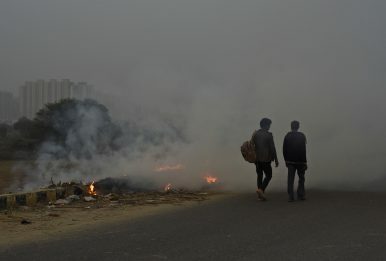 Recent protests against tree cutting underline Delhi’s problems with pollution.